A great exterior painting job can make your home stand out from your Providence neighbors and boost your resale value. The exterior finish is also important for protection against the elements in Rhode Island. Preparation is the most important step towards ensuring a beautiful and long-lasting exterior home, deck or fence painting job. mold and mildew in order to achieve maximum adhesion of any coating material. with special sealant. We take care of all the preparation as well as the painting. 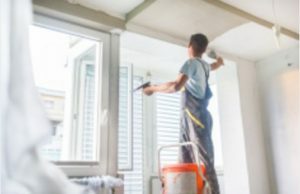 All surfaces receive a thorough preparation which includes: sanding, puttying, caulking, priming, and minor carpentry work. The final coat(s) is applied using paint of the owners’ choosing.